Microsoft made two key acquisitions last year with the explicit purpose of integrating them into Dynamics CRM, and on Wednesday it announced a spring wave of the customer relationship management software that brings those additions to light. Coming to online users in the second quarter of this year, the new release focuses on the integration of FieldOne and Adxstudio technologies for new field-service and Web-portal capabilities. It will also introduce project service, an offering that's designed to support complex, multi-day engagements and optimize resourcing with skills-based assignments. "With IoT technology there is a whole new opportunity to monitor device data, detect anomalies and proactively identify next best actions for maintenance and repairs," wrote Jujhar Singh, general manager of Microsoft Dynamics CRM, in a blog post. To provide such services, companies can now tap not only their internal resources but also those of third parties, Singh pointed out. "Through our service-delivery foundation, we bring project service and field service together within the core CRM solution to help companies manage resources across all sources of demand," he said. The CRM Spring 2016 wave also introduces new Web-portal capabilities for community engagement -- a result of the Adxstudio acquisition -- as well as guided navigation features for users. Two new machine-learning tools, meanwhile, are coming to Microsoft Social Engagement. 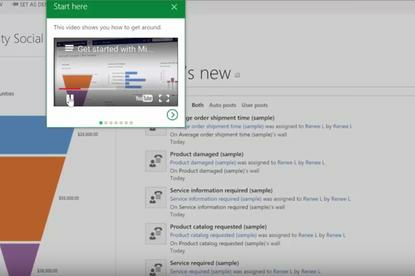 With automated triage, for example, Microsoft Social Engagement will automatically detect intention in social posts and, using machine learning, route them as cases or leads into CRM. "Many vendors are beefing up their field-service offerings, which shows that IoT and automated services at so many levels are still not enough," said Denis Pombriant, managing principal at Beagle Research Group. "Sometimes you just have to be onsite for a customer, but you need to provide services as cost effectively as possible." Last month, competitor Salesforce unveiled Field Service Lightning with a similar purpose. Community engagement is also "a huge need and opportunity," Pombriant said. In general, "notice how all vendors are making announcements about things that were once peripheral to CRM's stovepipes but that are nonetheless part of CRM," he added. "That's good for the industry."